James Milton “Jim” Wolf went to be with the Lord at 4:05 p.m. Saturday, Feb. 6, 2016, in Kosciusko Community Hospital, Warsaw. 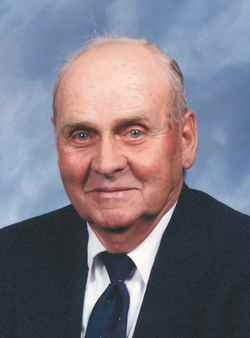 Jim, the son born to Merl J. and Elizabeth Lorena (Egolf) Wolf, was born in Atwood, on Nov. 30, 1925. He was a 1944 graduate of Atwood High School. Jim entered into active military service with the United States Navy on Jan. 29, 1944, in Indianapolis, and served during World War ll. AO2 James Milton Wolf was honorably discharged June 7, 1946, from Great Lakes, Ill.
On Feb. 11, 1950, he and Joyce L. Miller were joined in holy matrimony and would share 65 years together and raise three children. Jim lived his entire life in the Atwood area where he loved being a farmer of grain and livestock and was self-employed at Wolf Stock and Grain and Wolf Family Farms. At one time he was also employed by Explorer Van Co. (Warsaw) for over 12 years. Jim was a life member of Otterbein United Methodist Church (Atwood) where he loved and served his church family and his Lord Jesus. He enjoyed vegetable gardening and freely shared its abundance with family and friends. Jim belonged to the Atwood Lions Club, was a board member of the Atwood Community Building and in earlier years was a volunteer with the Atwood Fire Department. He was a member of the American Legion Post #49. Above all, Jim loved his Lord and his family. In addition to his loving wife: Joyce; memories will be treasured by his son: Joe Wolf, Atwood; two daughters: Ann (Steve) Collins, Tyrone, Ga.; Pam Slabaugh, Warsaw; seven grandchildren: Jennifer (Kevin) Ecenbarger, Bremen; James Robert Wolf, Atwood; Jody (Randy) Roberts, Atwood; Andrew Collins, Atlanta, Ga.; Brittany (William) Parker, Newnan, Ga.; Brooklynne Slabaugh, Charleston, Ill.; and Spencer Slabaugh, Bloomington; five great-grandchildren: Jama (Chris) Kolanski; Jared Wolf; Brody Ecenbarger; Cole Roberts; Chloe Roberts; two sisters: Juanita Frederick, Atwood; Anna Mary Harlan, Cincinnati, Ohio. Family and friends will gather for a time of sharing many special memories from 2-4 p.m. and from 6-8 p.m. Wednesday, Feb. 10, in Titus Funeral Home, Warsaw, and again one hour prior to the service in the church at 11 a.m. Thursday, Feb. 11, in Otterbein United Methodist Church, Atwood. Pastor Jim Lawson of the church, and a personal friend: Pastor Jim McKibbon, will officiate. Burial will follow in Stony Point Cemetery, Atwood, where military honors will be conducted by Warsaw’s American Legion Post #49 and VFW Post #1126. The family has asked that gifts in Jim’s memory by designated to Otterbein United Methodist Church, Atwood Lions Club or Atwood Community Building.